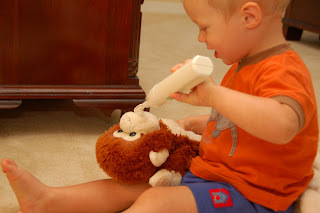 Dylan may not savor the teeth brushing experience himself, but he sure enjoyed "brushing" his stuffed monkey's teeth. 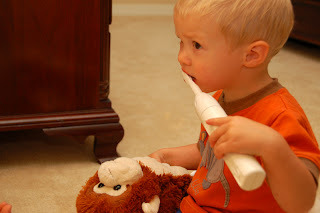 And brushing his monkey's teeth! Now you know how your toothbrush keeps getting fury. You're sure he's not using that on Thad?